The rise of social media and fake news challenge long-held assumptions about the First Amendment and are undermining the functioning of the "the marketplace of ideas," a Duke professor argues in a new article. "There are a number of very specific ways in which the structure and operation of today's digital media ecosystem favors falsity over truth; and this shifting balance raises some troubling implications for how we think about the First Amendment," says author Philip Napoli, professor at Duke's Sanford School of Public Policy. Much of our thinking about the First Amendment assumes that the answer to false speech is more speech, or counter-speech, and that the truth will triumph in the marketplace of ideas, he says. Yet changes in the news media - such as consumption via social media, the speed and targeting capabilities of fake news purveyors and "filter bubbles," where people only see news that reinforces their views—mean we can no longer assume legitimate news will win, Napoli says. The article, "What If More Speech Is No Longer the Solution? First Amendment Theory Meets Fake News and the Filter Bubble," was published Monday in the Federal Communications Law Journal. 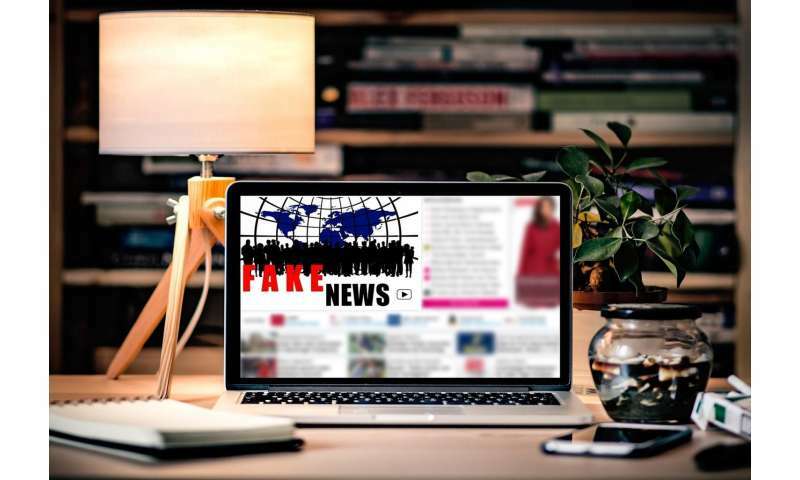 In the last two decades, technological and economic changes have undermined legitimate news production and enhanced fake news. Despite the flood of news available online, the actual proportion of original reporting is declining. "Original reporting is costly. Fake news is cheap," says Napoli. Meanwhile, audiences have increasing difficulty distinguishing between true and false news. Recent surveys suggest people now evaluate news not based on its source, but based on the trustworthiness of the person who shared it. The 2016 election is a case study of the failure of the marketplace of ideas, Napoli said. Filter bubbles and fake news, including Russia's online propaganda efforts, made it difficult for citizens to access accurate information, Napoli said. Meanwhile, big social media platforms have considered themselves tech companies, not publishing or media companies. The public service ethos and journalistic standards of traditional media are not part of their business models. Google and Facebook have not acted as gatekeepers keeping out fake news in same way that traditional news outlets such as The New York Times or ABC News do. Social media companies also bear no legal liability for falsehoods, Napoli notes. He recommends that social media companies develop a robust public service ethos appropriate to their responsibilities as providers of the news and information essential to a functioning democracy. The recent Congressional testimony of Facebook founder Mark Zuckerberg shows that Congress has taken an interest in the issue. "The key question is if or how government intervention might be an appropriate response. Germany recently adopted a law that requires social media platforms to remove stories identified as fake news or face government-imposed fines," Napoli says. In the U.S., broadcast media adhere to federal regulations about false news reporting, and the Federal Communications Commission can choose to investigate reports of intentional falsification of the news. "It is important to recognize that concerns about fake news have an established foothold in the U.S. media regulatory framework," Napoli says. Recent surveys suggest people now evaluate news not based on its source, but based on the trustworthiness of the person who shared it. Nothing new here. People have always evaluated news based on how much they trust the source. What's new is that traditional news outlets that most Americans (wrongly) assumed to be unbiased and trustworthy have been undermined by investigative reporting by emerging media outlets like the blogosphere which has revealed the bias of traditional outlets that has always been there. It's the fall from grace of mainstream media and its declining influence that has caused this latest furor. Powerful entities do not go gentle into that good night. Social media doesn't investigate or report news, it simply passes along news from other outlets, spiced with the commentary and bias of the people who post it. Those who rely on social media for news deserve what they get. The rise of social media and fake news challenge long-held assumptions about the First Amendment and are undermining the functioning of the "the marketplace of ideas,"
News flash: the First Amendment isn't a social engineering construct designed to make sure people get accurate information. It's a protection of a basic human right. The First Amendment guarantees that people are free to express any idea they want, no matter how demonstrably false, implausible or offensive. It's always fascinating that the people who want to restrict free speech are the ones who claim to be the most tolerant...except when the speech offends them or challenges their assumptions or beliefs or humiliates their sacred shibboleths. The most ironic recent example are the "Antifa" protesters who use fascist tactics to combat supposed "fascism". As much as free speech may at times be offensive, the alternative to free speech is far worse. But there are questions. For example, who decides what is fake news, and who appoints or approves the appointments of those individuals? What outlets are liable for publishing it? How are they liable? What outlets are not liable, allowing literally anything, without reference to its truthfulness? These are the hard questions. The traditional media, like newspapers and news shows, are already liable. Social media are not. Entertainment is not. One of the big arguments is whether Fox News is liable, since they label their reporting "entertainment." It started there and grew into social media. Now we have a mess. And the question is, what do we do about it? It's becoming clearer and clearer that we have to do something or compromise democracy. But we must not do too much; expression must remain free, but be labeled as free expression without liability, and those who choose to be liable must be more trusted. and just who is holding them liable ? For news on radio and TV, the FCC. They can both cancel your license and, in some cases, refer your case to the US Attorney for prosecution under 18 US Code § 1038. For newspapers, and also for radio and TV, 18 US Code § 1038 covers false reporting in the criminal context. In addition, US legal doctrine in the courts is that there is no First Amendment protection for the press in the case of false statements; however, an exception to this is statements about public figures, particularly in the case of members of government. On the other hand, even regarding public figures, if there is both knowledge that the reporting is untrue, and a mens rea of malice can be established, then there can be liability in court. This area of the law is very complicated and the bars to prosecution or civil tort proceedings are very high in order to preserve First Amendment rights to both free speech and freedom of the press, but there is definitely liability here. So when someone starts talking about prosecuting reporters, or traditional media outlets, for statements about public figures, this is mostly hot air because of legal doctrine in precedent. But it's possible to get in trouble if you're outrageous enough. and what we have seen is not outrageous enough ? The federal government has very limited powers. Despite the claims of totalitarian statists and other leftists, enforcing honesty and good manners are not among the powers granted. No it doesn't. Courts have long supported the notion that shouting "Fire!" in a crowded movie theater is not protected speech. Thanks for lying to us!